The Jubilee Pump was erected to commemorate the diamond jubilee of Queen Victoria. Rawcliffe is a civil parish comprising the picturesque village of Rawcliffe and the village of Rawcliffe Bridge in the East Riding of Yorkshire. Sitting alongside a wide bend in the River Aire, Rawcliffe is north of the M62 and roughly midway between Goole and Snaith on the A614. Known in the past as the “Queen of Villages” Rawcliffe has one of the largest open spaces in the country and this, the Village Green, is the centrepiece of what was once a thriving port before Goole was developed. 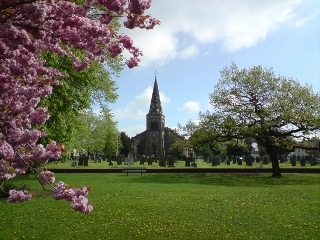 The Parish church of St. James the Apostle sits at the centre of the village and a modern estate occupies land nearby that was once the site of Rawcliffe Hall owned variously by the Boynton and Creyke families until it was used by the NHS as a hospital before, sadly, being demolished. Rawcliffe has its own peculiar personality in the form of Jemmy Hirst. Born in Rawcliffe in 1738 he was a true eccentric and his fame or infamy led the King, George III to summon him to London and he went, so the story goes, in a wicker-work carriage pulled by Jupiter, his bull! The village of Rawcliffe Bridge, though small, boasts the founding home of Croda the largest supplier of creams and lotions to the cosmetic industry. Founded in 1925 by Messrs Crowe and Dawe (hence CRODA) it began life as a supplier of lanolin and has since become a world-wide company. Similarly the chain of Costcutter retail shops was founded by Colin Graves in 1986 who was raised on a farm near Thorne and attended Goole Grammar School and one of his first shops was in Rawcliffe Bridge. Cepac also has a base in Rawcliffe Bridge. They are the UK's leading independent corrugated packaging supplier with bases in Doncaster and Rotherham. Also in Rawcliffe Bridge is Sugar Mill Ponds a dedicated Nature Reserve and Fishing attraction. More details can be found on its own website. More information can be found in the booklet “Rawcliffe, the Queen of Villages” published in 2006 (2nd Edition) and locally available. The Rawcliffe and Rawcliffe Bridge Archive, which is housed in Rawcliffe Village Hall, also contains much fascinating information in its growing number of volumes. © Rawcliffe Parish Council. All Rights Reserved. Design by Vision ICT Ltd.